This raw-milk, blue cows cheese is made in Nottinghamshire. I bought some from Rennet and Press, and it’s also available from Neal’s Yard Dairy. 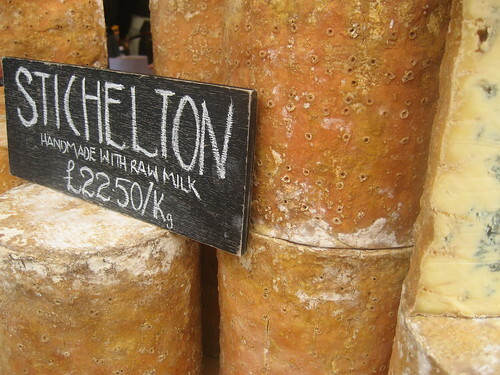 Stichelton’s a stilton-like cheese, but made with unpasturised milk. It’s a moist cheese, pale yellow, with a deep green-blue veining that’s denser towards the centre of the cheese. It’s gloriously rich and buttery, smooth and soft, melting in my mouth. There’s a bright rich spicy, blue taste, and some underlying caramel sweetness, and a fruityness that’s not too dense and not too tart – pears and apples, I think. Lots of toasty, smooth hazelnut flavours, and a decent, but not overwhelming, amount of salt round it out. The rind’s delicious, too – the fruit and caramel notes come to the fore out at the edges where the veining’s less intense. Corruptible Vegan is definitely corrupted by this cheese. She hacks lumps off and eats it straight from the knife. Cheesy woofer: When Finn smells me taking this out of my bag he spontaneously sits down in anticipation, wagging his tail with hungry glee. How can I not let him sample it? He declares it delicious, and eats even the bluest bits from the centre. Conclusion: Delicious, and proper Christmassy, this cheese. We have another wedge of this waiting for Christmas evening and a glass or two of port.